Albany | Capital Region of New York Real Estate :: 518Realty.com Inc.
Albany is the state capital of New York and the seat of Albany County. Roughly 135 miles north of the City of New York , Albany developed on the west bank of the Hudson River , about 10 miles south of its confluence with the Mohawk River . The population of the City of Albany was 97,856 according to the 2010 census . Albany has close ties with the nearby cities of Troy , across the river; Schenectady to the west on the Mohawk River , and Saratoga Springs to the north, forming a region called the Capital District . This is comprised mostly of the Albany-Schenectady-Troy Metropolitan Statistical Area . The area’s 2010 population was 870,716, the 4th-largest MSA in New York and the 58th largest in the country. During the late 18th century and throughout most of the 19th, Albany was a center of trade and transportation. It is located on the north end of the navigable Hudson River, was the original eastern terminus of the Erie Canal connecting to the Great Lakes , and was home to some of the earliest railroad systems in the world. Albany’s main exports at the time were beer, lumber , published works , and ironworks . Beginning in 1810 , Albany was one of the ten most populous cities in the United States, a distinction that it held until the 1860 census . In the 20th century, the city opened one of the first commercial airports in the world, the precursor of today’s Albany International Airport . During the 1920s a powerful political machine controlled by the Democratic Party arose in the state capital, connected to politics in New York City as well. The city’s skyline changed in the 1960s with the construction of office towers around the Empire State Plaza and at the uptown campus of SUNY Albany , mainly under the direction of Governor Nelson Rockefeller . While Albany experienced a decline in its population due to urban sprawl , many of its historic neighborhoods were saved from destruction through the policies of Mayor Erastus Corning 2nd , the longest-serving mayor of any city in the United States. In the early 21st century, the city has experienced growth in the high-technology industry , with great strides in the nanotechnology sector. Albany has been a center of higher education for over a century, with much of the remainder of its economy dependent on state government and health care services. The city has rebounded from the urban decline of the 1970s and 1980s, with noticeable development taking place in the city’s downtown and midtown neighborhoods. 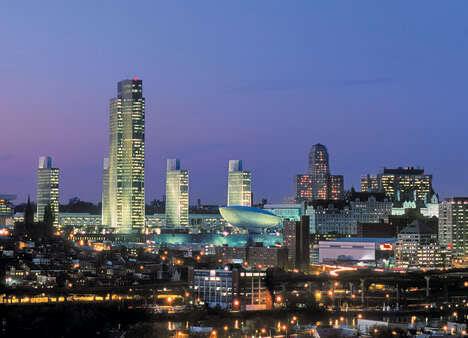 Albany is known for its extensive history, culture, architecture, and institutions of higher education. The city is home to the mother churches of two Christian dioceses , as well as the oldest Christian congregation in Upstate New York . Albany won the All-America City Award in both 1991 and 2009.